I have been on many rides at many amusement parks but the wildest ride I ever went on was at a place called Fair Park in Nashville, TN. The late, great, Fair Park was closed down years ago. The old wooden roller coaster was dismantled. The Tilt-a-whirl tossed in the scrap heap. But there is one wild ride that still lives in my memory. The ride looked a little bit like a ferris wheel, only instead of two wheels with baskets hanging between them, this evil contraption had enclosed “cars” in line with a single wheel. 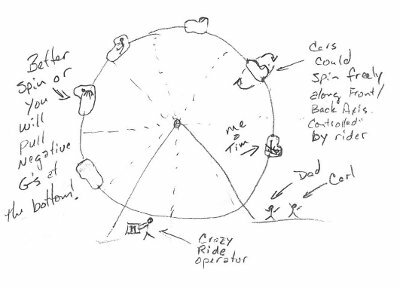 Imagine if you took the basket loose from one side of a traditional ferris wheel, swung the loose end behind you and attached it to the same circle, then turn the seats 90 degrees so that you are facing along the outside of the wheel like a normal ferris wheel. The basket was an enclosed cage, making it slightly safer, but no less wicked. And I rode it. It started with a dare from my uncle Carl. He dared me and my uncle Tim to ride it and promised to pay us each five dollars if we would. I was maybe 10 years old at the time. Tim was only 4 years older than me, and evidently not much wiser, so we agreed. I don’t think there is any way this could happen today. We are both much older and wiser, the rides are much safer, and five dollars won’t even buy a decent lunch. Back then, it was a different story. Tim and I wanted the five bucks, and the ride operator had replaced his height requirement sign with one that said You-Must-Be-This-Dumb-To-Ride-This-Ride. Unfortunately, I qualified. So, Tim and I climbed aboard and strapped in for the ride of our lives. I spent the next few minutes doing uncontrolled loops, dangling by my waste from a loose fitting strap, hanging on for dear life while loose change from my pockets first fell below me, then pelted me in the face as we went around the loop and started back up. It was like constant loops of “blast off” heading straight up with our backs in the seat like astronauts, over the top, then straight down in a nose dive. We were supposed to be able to control the thing ourselves by turning a wheel that would spin the car as we went over the top and at least keep the G forces positive. That was the theory. But for a skinny 80 pound kid that could easily slip through the loose strap, it was not an option. Both hands were completely busy hanging on for dear life. So, as often as not, we went around the loop on the wrong side, hanging completely upside down, pulling negative Gs and screaming our lungs out. Even when the ride was finishing up, the torture continued. Stopping to let the other guys off at the bottom was a nightmare when we were the ones in a nose dive for the ground. I wondered if the ride operator knew or cared about my predicament as I hung there, suspended by that canvas strap around my waste while some guy in the bottom car stumbled out and kissed the ground. At last it was our turn to exit the ride, which we did swiftly, albeit with a little less change in our pockets. We proudly collected our five dollars, and acted like we would be glad to ride it three or four more times if they would be willing to pay up. Mercifully, Dad and Carl decided we had better move on to something a little less exciting. I don’t remember anything about the rest of that day, but the ride of my life was forever burned in my memory. Fair Park is now gone. We never climbed on that crazy ride again. Even so, there are times when I feel like I never got off that ride. The Thai Cuisine restaurant was a great place to eat. I discovered it years ago right after it opened. They had good food at a good price so I went often. I told others about it. After a few months, the place got busier and it became harder to get a table. They had a thriving lunch-time business, and rightly so. But something must have happened. Yesterday I noticed the restaurant was closed. I wonder how long it has been that way? How long has it been since I was there? 10 years? Why did I stop going? Perhaps one reason is that I found a better place. The better place is a little grill called Pickles. I meet my wife and kids there for lunch. My son grew up doing his home-school work at the restaurant table, while waiting for me to take my lunch break and meet them. The people know me. They know us. When I walk in and sit down by myself, the hostess asks if my wife and son will be joining me. She even seems a little dissapointed when they don’t come. She asks about them, and tells me about her kids. How are they doing in school? We talk and get to know each other a little better each visit. Today I learned that she doesn’t like snow. She had her fill of it when she lived in Connecticut. I also learned that her home country has weather much like Florida. Mildly cool winters in the north, warm all year in the south. No matter how busy the lunch hour, the hostess always makes time to talk to me. She and her husband own the place, and I am her favorite customer. Me and just about everyone else that walks in the place. At Pickles, you pay for the burger, but friendship comes free. Perhaps that is one reason they have outlasted the Thai restaurant. They know one of the secrets of life: It’s about people. And Jesus, when he came out, saw much people, and was moved with compassion toward them, because they were as sheep not having a shepherd: and he began to teach them many things. . . . and they did eat and were filled.